Sophomore Laurel Pereira led the Tartans with a game-high of 23 points, and 10 rebounds, recording the first double-double of her career. Sophomore MaKayla Filiere had 13 points, and sophomore Megan Jaeb added 10 points, matching her career high. Junior Jenn Mayberger had team highs in assists and steals, with seven and four, respectively. First-year Kylie Huffman hauled in a team high of 11 rebounds off the bench. The Spartans struck first with a layup in the opening minute of the first quarter, but the Tartans quickly took the lead with a three-pointer from Mayberger. Five other Tartans reached the basket as the teams traded shots and the lead for the rest of the quarter, which ended with the Tartans leading the game 18–14. The Tartans outscored the Spartans 23–11 in the second quarter with 50 percent shooting and held the visitors to only 21.4 percent shooting. Pereira took control of the Tartans’ defense with 16 points on 5-for-6 shooting. 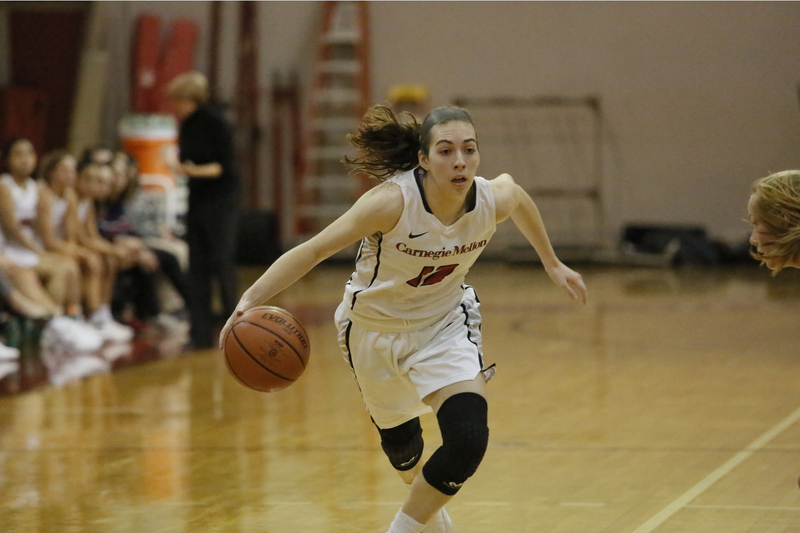 Pereira opened the quarter with back-to-back jump shots and later scored seven straight points to build the Tartans’ lead, which was as much as 21 points a minute left to play. The Spartans responded with the final five points of the quarter to close the half, trailing the Tartans 25–41. Coming out of halftime, the Spartans scored five points for a total 10 straight points continuing from the second quarter. Filiere ended the Spartans’ run with a three-pointer to make the score 44–30. With 2:22 left in the third, the Spartans cut the lead to 9 points, but the Tartans responded with another Filiere three-pointer to extend their lead back to double-digits. The Tartans maintained their lead in the fourth quarter, winning the game 71–55. Overall, the Tartans shot 46.4 percent from the field, including 42.9 percent from the three-point line, the team’s third-highest team shooting percentage of the season. They benefited from more than four times as many bench points, 21 to the Spartans’ 5, as well as 10 more points in the paint. The team also recorded more rebounds, assists, and second chance points. The Tartans finish the 2017-18 season with a 10–15 record, 2–12 in UAA play, down from last season’s 21–7 (7–7 in UAA play) record. Will all 12 players on the roster returning, the Tartans will look to build on what they accomplished as they look to next season.